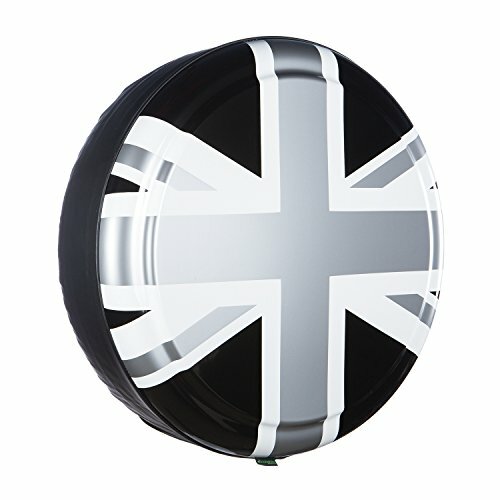 Boomerang® Rigid tire cover featuring Union Jack printed in stunning full color pewter, black and white over the entire molded ABS plastic face. The tread is covered with a durable automotive-grade soft vinyl band that is stitched to the heavy duty, face plate. You will love the easy installation, superior protection and upscale look our Banner Series Rigid tire covers add to the rear profile of your vehicle. This item is made in the USA and is backed by our standard 3-year limited warranty. Fits all 35" diameter spare tires including Hummer H2, etc.